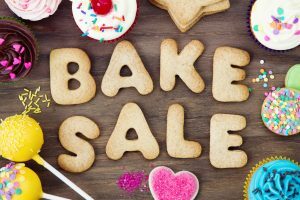 A bake sale is one of the easier fundraisers to run and can be used as part of a larger event (such as a craft sale for the holidays or some kind of sporting event). It is one of our most popular ones, but make sure you check with school rules before assuming you are allowed to host a fundraiser. Some schools are now requiring healthier alternatives at bake sales. Enlist the help of all the bakers in your group and ask for their assistance — they may have specialities that they enjoy making. Make sure that each volunteer sends a list of the ingredients used along with their baked goods. It's worth having an assortment of different types of dessert to meet every taste, ranging from cakes and pies to smaller alternatives like cookies and muffins. Package items in different amounts (for example, cookies could be bought individually or in a bag) to ensure you have something for everyone and every budget. All of the items in your bake sale should be clearly labelled with the price and ingredients list. To avoid allergic reactions, any products that contain nuts should have this information on them. When the day of the sale comes round, set all of your baked goods up on a long table together with a cash box for sales (you should start off with at least twenty dollars in small bills and coins in case people need change). Selling bottled water and soda to wash down your yummy treats is another good idea. You can find more detailed information in our full article about holding a bake sale here. I love bake sales. Just remember, you have to raise enough money to make up for all the ingredients! Our Youth Tackle Football team is looking for anyone willing to donate money so they can start their next season off on a good note with new equipment. You can email me with any info and i will run it by our coaches. Thank You.